Well we’ve been open for a whole month and I wanted to take a moment tonight to stop and smell the roses. I can’t begin to express our gratitude to all the people who helped and continue to help us with this bicycle shop. I wouldn’t want to get all mushy on the internet either. Anyway, if you have time this spring you should take a bicycle tour. I was flipping through some of my good friends’ flickr pages and found this one of our fellow worker Rusty. Our friend Jim took the photograph. It made me feel like throwing a rack on a bike and filling a pannier with way to much gear to go too short a distance to warrant it all. (You never know when you’ll need a roll of quarters or a 24 pack of AA batteries on tour!) I jest. 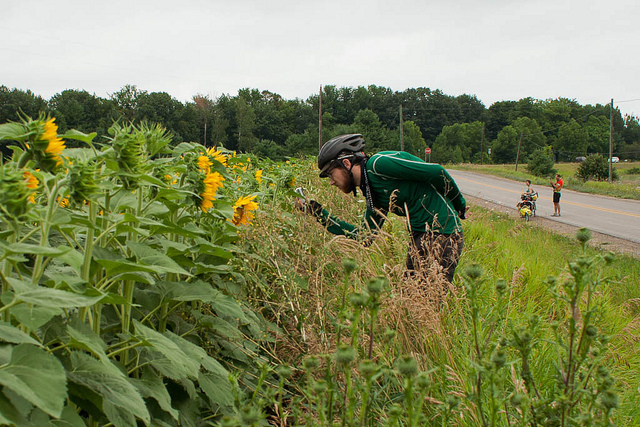 Bicycle touring in North America helps bring a city slicker back in touch with the slower moving, humble, and often lonely parts of the country. On the other hand it can give you a slow motion view of how giant corporations can tear the identity from small towns and counties. Both views can be quite moving and bring a new vigor to your everyday life back in the city. Whether it is questing for a better local economy, the freshest healthy food, improved transportation infrastructure, or just a perfect pub to converse in, sometimes we all need to hit refresh. And we’re cyclists so we will do so on bicycles. Nothing like a front of warm air to churn up the long conversations about spoke count, rim width, and, of course, the ever entertaining freewheel vs freehub discussion involving the great bicycle tour. 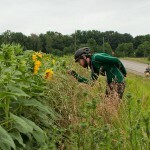 Stop in if you want to share bicycle tour stories some day, I’d love to chat. If you are going on one soon let us know if you need help with anything. This entry was posted in Touring and tagged bicycle, rims, tour, touring, wheels by admin. Bookmark the permalink.